Our first time buyers and downsizing buyers are feeling the price squeeze. Market activity in this price range is brisk and prices seem to be elevating our entry level market as we emerge from the Great Recession of 2008. 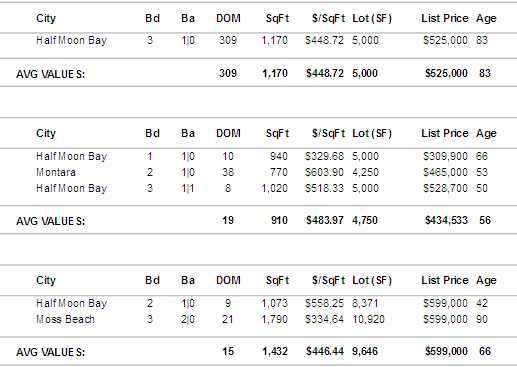 The bottom of the market is most likely behind us for entry level on Half Moon Bay Coastside. Here are two images directly from the MLS of the Coastside market in the last 30 days (April 15 to May 14). The first image is of PENDING LISTINGS up to $600,000. Price per square footage is up. Inventory still trickling in – usually 2-3 on the market at a time in this price range right now. I believe more will be sold over asking price in this month. The second image is of CLOSED SALES up to $600K. These properties went into contract as far back as March or earlier. Only 2 of the 6 sold for over asking. “COE” means close of escrow (date). WE’RE IN THE THICK OF THE SPRING MARKET RIGHT NOW. Here are homes for sale now on the Coastside (Half Moon Bay, El Granada, Moss Beach, Montara) up to $650,000 asking price.